Interestingly, you can boost or cut the Mid frequencies as well, depending on how you set the bass and treble knobs. Finally, this compact pedal offers straightforward connectivity, with XLR or 1/4" Line Out, along with a Parallel 1/4" out that lets you route your dry signal to your amplifier on stage. Dimensions: 5.8" x 4.2" x 2.5"
"Great" is an adjective that was consistently used by reviewers to describe this preamp. And even with version 2 already out, the original SansAmp BDSR continues to rake in new positive reviews. The overall sentiment is that this preamp has the right balance of sound quality, portability and connectivity, enough to handle most of what bass players need. It boils down mostly to taste, with a few users specifically complaining about the way the preamp compresses the sound. A few others advise getting the newer version over this one. 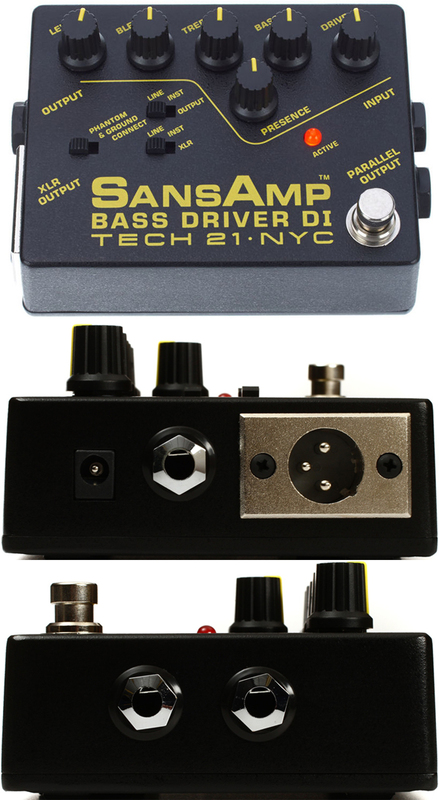 If you're looking for the tried and tested path, or if you are new to bass preamps and are not sure what to get, then start with the SansAmp Bass Driver DI.